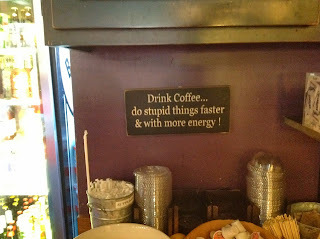 This week's edition of Weekly Indicators is coming to you from one of my favorite places in the whole world, Aroma's Coffeehouse in Colonial Williamsburg. Month over month August data included the Index of Leading Economic Indicators, up strongly, suggesting good growth for the next 6 to 8 months. Industrial production improved to a post-recession high, capacity utilization was up, the Philly manufacturing index improved, although the Empire State index decelerated. Existing home sales were up. 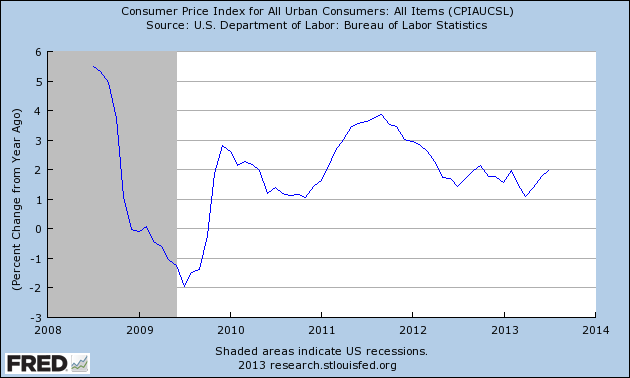 Consumer prices barely budged. 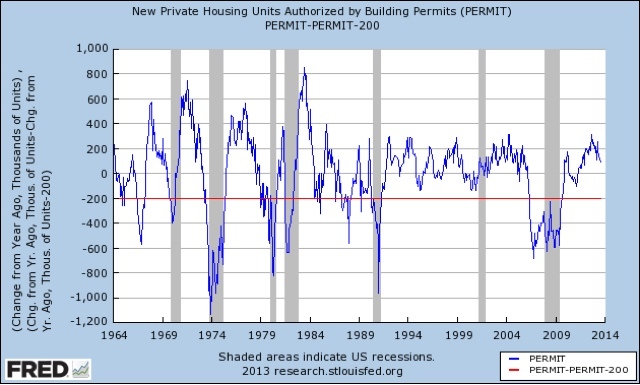 A big negative was the decline in housing starts and permits. Steel production over the last several years has been, and appears to still be, in a decelerating uptrend. It had been negative YoY, but turned positive one week ago. Rail transport had been both positive and negative YoY during midyear, but this week was the sixth positive week in a row since then, and equals its most positive showing in a long time. The Harpex index had been improving slowly from its January 1 low of 352, but has generally flattened out for the last few months. The Baltic Dry Index has rebounded to make nearly a 2 year high. In the larger picture, both the Baltic Dry Index and the Harpex declined sharply since the onset of the recession, and have been in a range near their bottom for about 2 years, but stopped falling earlier this year, and now seem to be in an uptrend. We can now estimate that after adjusting for state reporting glitches, one week ago initial jobless claims were ~318,000, still a 6 year low. Jobless claims remain firmly in a normal expansionary mode. Like each of the last three years that this same, a good, downside breakout has occurred. Gallup's 14 day average of consumer spending is positive, but significantly less so than earlier this year. The ICSC varied between +1.5% and +4.5% YoY in 2012, while Johnson Redbook was generally below +3%. The ICSC has been weakening but improved for the second week in a row, and Johnson Redbook remains at the high end of its range, and has actually been improving. The price of Oil continued its retreat from its recent 2 year high. The 4 week average for gas usage turned slightly positive, after two weeks of being slightly negative. Refinancing applications have decreased sharply in the last 4 months due to higher interest rates, although this week's rebound makes up almost all of last week's precipitous decline. Purchase applications have also declined from their multiyear highs in April, but are still ever so slightly up YoY. Real M1 made a YoY high of about 20% in January 2012 and decelerated since then. Earlier this year it increased again but this week made a new 2 year low (although it is still positive). Real M2 also made a YoY high of about 10.5% in January 2012. Its subsequent low was 4.5% in August 2012. It increased slightly in the first few months of this year, then stabilized, but has declined again in the past several months. The TED spread is still near the low end of its 3 year range, although it has risen slightly in the last few months. LIBOR established yet another new 3 year low this week. This week was generally positive, with the same concerns about the long leading indicators as I've had for the past several months. Interest rates are negative, mortgage applications and real estate loans have turned negative, and now even purchase mortgage applications are just barely positive YoY, and money supply is decelerating although still positive. Spreads between corporate bonds and treausries also were negative this week. The shorter leading indicators of initial jobless claims are positive, even adjusting for California's computer problems. Temporary employment has turned strongly positive in the last two months. The oil choke collar is engaged but has eased off, especially as to gasoline. Commodities are neutral. 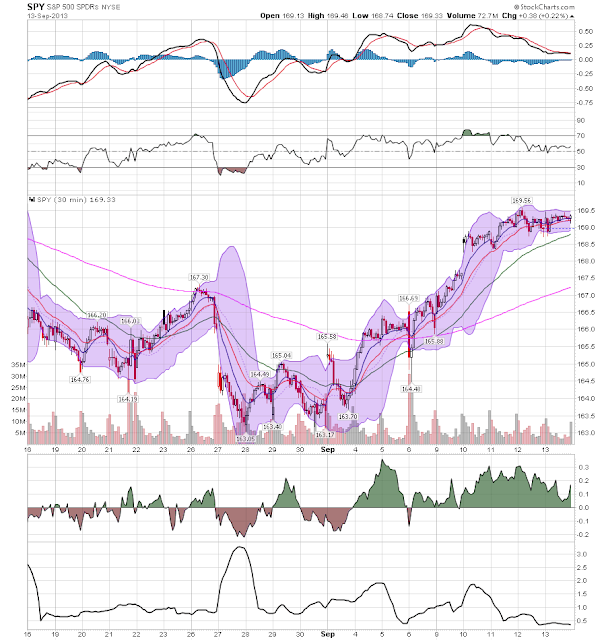 The coincident indicators once again look like they have broken out positively. 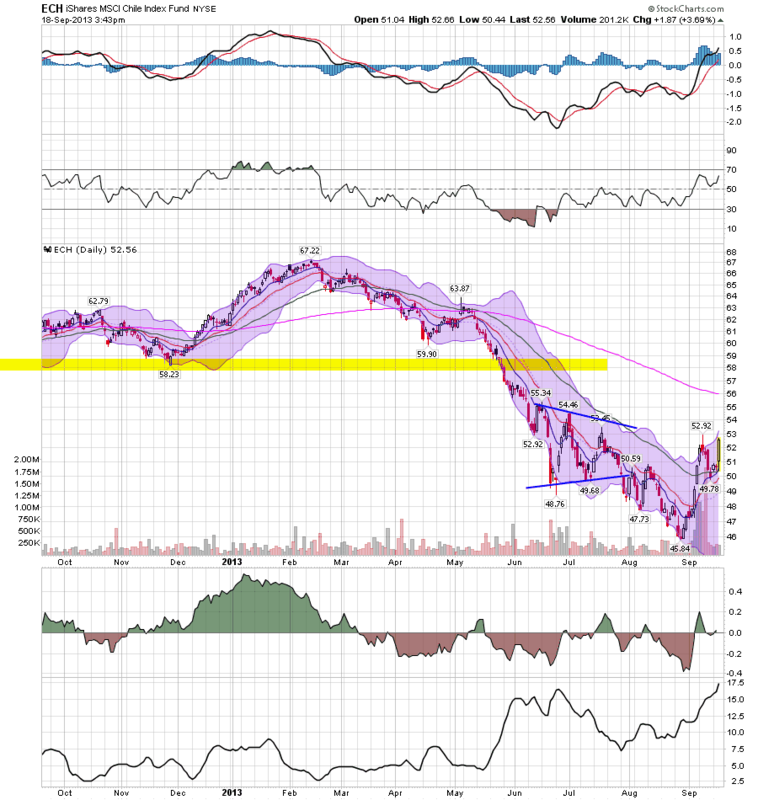 Rail traffic, which had been a real concern, has broken to the upside strongly, as has shipping. Steel production is positive. Consumer spending is holding up reasonably well. Bank lending rates are at or near or at record lows. 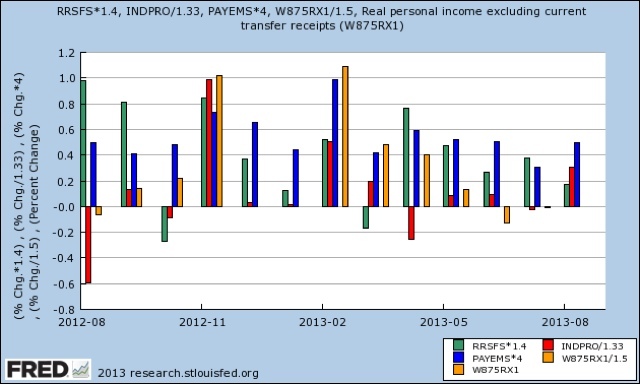 Tax withholding has also improved moderately in the last couple of weeks. House prices remain strongly positive. Once again this week the story remains, if Washington can avoid destroying things, the economy appears ready to pick up steam again for the rest of the year. I still remain much more cautious about 2014. . The old textile mills here are mostly gone now. Gaffney Manufacturing, National Textiles, Cherokee — clangorous, dusty, productive engines of the Carolinas fabric trade — fell one by one to the forces of globalization. Just as the Carolinas benefited when manufacturing migrated first from the Cottonopolises of England to the mill towns of New England and then to here, where labor was even cheaper, they suffered in the 1990s when the textile industry mostly left the United States. It headed to China, India, Mexico — wherever people would spool, spin and sew for a few dollars or less a day. Which is why what is happening at the old Wellstone spinning plant is so remarkable. Drive out to the interstate, with the big peach-shaped water tower just down the highway, and you’ll find the mill up and running again. Parkdale Mills, the country’s largest buyer of raw cotton, reopened it in 2010. 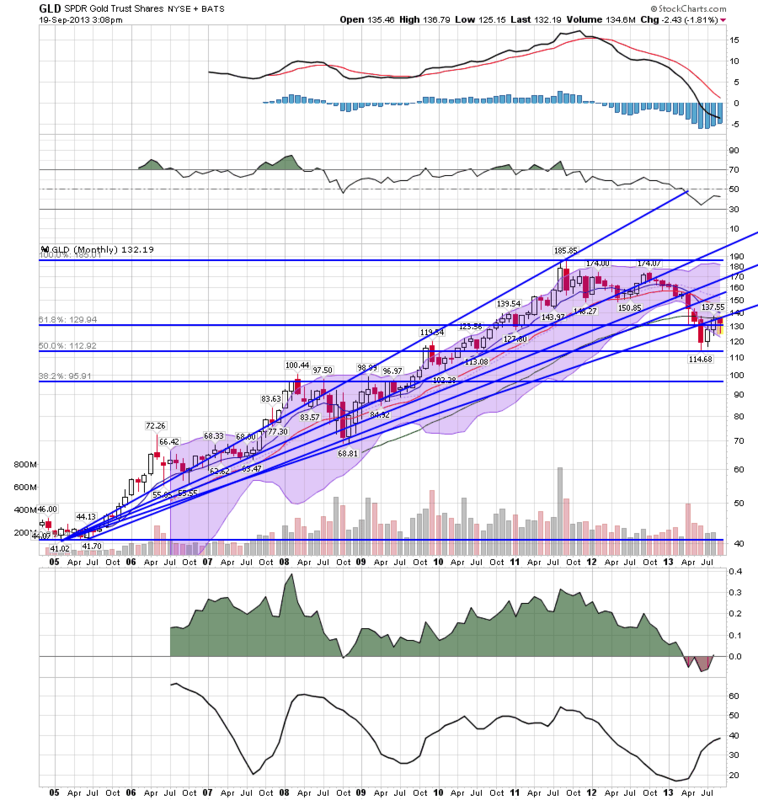 Gold's monthly chart is still very negative. 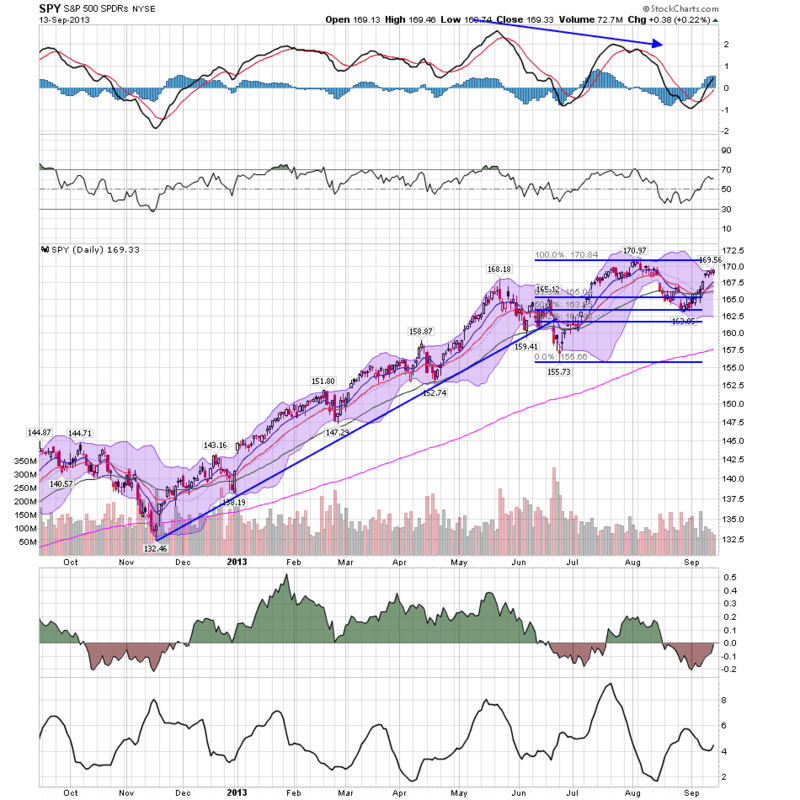 Prices broke their multi-year uptrend earlier this year and fell to the 50% Fib level from the long rally. However, the recent move higher uses the Fib fan trend lines as resistance, indicating the bounce is a technical one. Also note the declining momentum and weak CMF readings. Why do Doomers hate Supertrains? There's been something of a Doomgasm since the Census Bureau's annual median household income data came out a few days ago. As I predicted two months ago, it basically went sideways from 2011 to 2012. This also means that it is below 2009, below 2007, and below 1999, which remains the peak. The reason it went sideways is because real median wages have stalled, and there the ongoing decline in the employment to population ratio even since the late 1990s also stalled. And one more reason I'll discuss below. Since people who are unemployed or retired bring in much less, or no, income, the median household income is dragged down as well. I don't mean to suggest that median household income isn't a valid measure. With 70% of the economy being consumer spending, if households have less money, then consumer spending will suffer accordingly, especially since lower income households spend a higher percentage of their income. It's simply important to realize that this doesn't necessarily reflect a decline in real wages. Nevermind. The Doomer mind is obsessed with the fact that we can't be in an economic recovery because household income insn't recovering, at least through the end of last year. Of course, by the same standard, with the exception of one year, we never really recovered from the 1973-74 recession until 1986, and we haven't recovered from the bursting of the tech bubble in 2000 at all. That's just semantics. The real problem with this obsession is that it overlooks *why* median household income continued to fall even after the unemployment rate, and the employment to population ratio both bottomed in 2009. As I've pointed out numerous times over the last couple of years, that has everything to do with the continued high price of gasoline, which went over $3 a gallon apparently permanently in 2010, after a secular rise from $0.92 a gallon in early 1999. We have an incredibly wasteful transportation system, which forces people to use cars even where a well designed mass transit system would work efficiently, save time and aggravation, and save travelers lots of money. 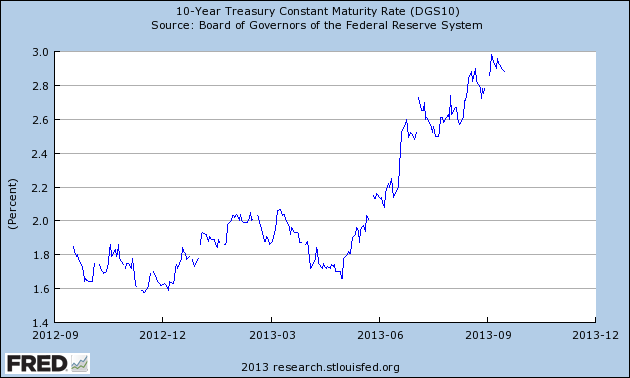 Up until the last few months, we had once-in-lifetime low treasury bond rates. We could have made use of those rates to build, or rebuild, lots of infrastructure, including a transportation infrastructure that helped consumers in the face of likely permanently high gas prices. Or, as Atros puts it simply, SUPERTRAINS! The Doomer obsession with "green shoots! ", "printing fiat money! ", airquote "recovery! ", and the like means they fail to see - in fact, don't want to see - how important the price of gas has been in holding back ordinary consumers, and how important it is for this country to break free of the Oil choke collar. So Doomers hate Supertrains. I know math is hard, but maybe if they really learned how to do it, they could see how much it would help the people they claim to champion if they focused on the reasons why some measures of average Americans' well-being haven't improved. This week for the second week in a row we got extremely low initial jobless claims, but marred by computer glitches, mainly in California. That doesn't mean we can't make a reasonable approximation of what those claims would be had there been no glitches. Last year I was able to show that, ex-Superstorm Sandy, initial claims were probably still declining, by digging into the internals of the state by state reports. It looks like the same thing is happening this year, i.e., there is a real decline, but it is being masked by the computer problems. Here's the way the calculation works. One week after the initial report, the DOL gives a state-by-state breakdown of non-seasonally adjusted, and seasonally-adjusted, claims for the prior week. So, this week the DOL gave the breakdown behind last week's 292,000 number (revised to 294,000 this week). What we do is, we take out the claims from the affected state, in this case California, and make the assumption that had there not been a glitch, California's claims would have reflected the same trend as in the other 49 states. If California actually followed the same trend as the other 49 states, then all we need to do is multiply last year's SA number of 381,000 by 0.8193, which gives us a little under 318,000. That's probably pretty close to what last week's number of intial jobles claims would have been had there been no computer glitches. Since the DOL told us that California and Nevada were still "working through" their computer issues, that probably means that they have caught up on some but not all of their backlog. In other words, this week's number 0f 309,000 is probably a lot closer to the real number than last week's. This adds to my confidence that initial claims probably have continued their recent declining trend, even if not by as much as the raw reports suggest. The Federal Reserve shocked the world Wednesday with the decision to, well, keep doing what they've been doing for a year now. That is, the central bank is buying $85 billion in bonds every month, and will keep buying $85 billion a month for now. So the money will keep flowing, the "taper" is postponed for another day, and the stock market is euphoric. But why? One reason is that interest rates have risen in global financial markets in the past few months, in part due to Fed signaling about the taper, which may slow growth. But for another key answer, walk out the front door of the Fed's headquarters on Constitution Avenue, turn left, and walk 20 blocks until you run into the United States Capitol. 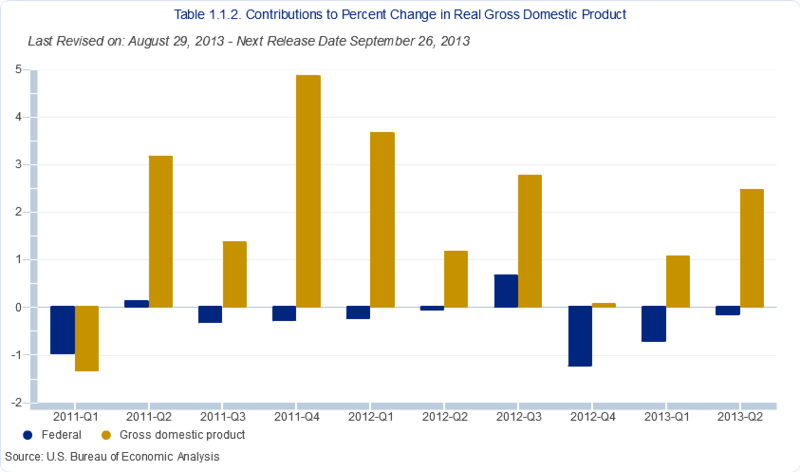 Over the last 10 quarters, government spending has subtracted from growth in all but two quarters. Taking into account the extent of federal fiscal retrenchment, the Committee sees the improvement in economic activity and labor market conditions since it began its asset purchase program a year ago as consistent with growing underlying strength in the broader economy. Here's the bottom line: Washington and its constant shenanigans are detracting from overall growth. It's that simple. As I noted last week, Latin America has sold off as a result of the Fed tapering talk. However, this is not an overall reflection of the region's economies which have done a great deal to improve their respective competitiveness over the last 10-20 years. 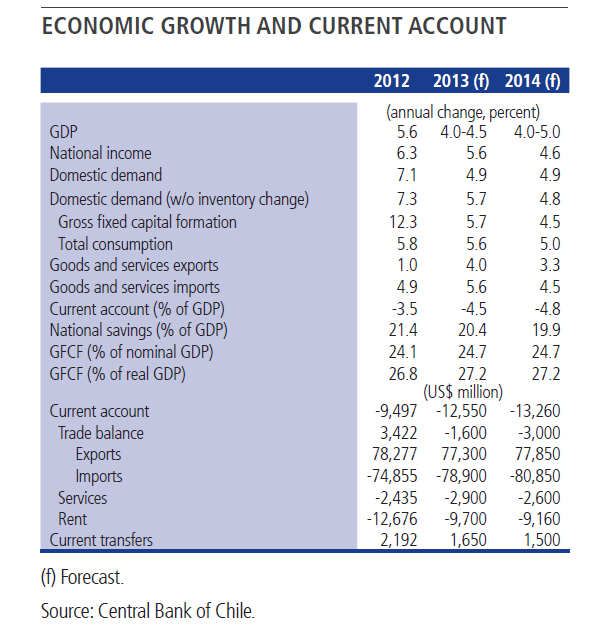 Chile has been slowing, but that's a relative term. The numbers above are still impressive from a Y/O/Y perspective. Domestically, recent output and demand figures continue along the lines of previous months: moderate growth in output and strong private consumption. Headline inflation is still within the tolerance range, while core measures continue to hover around 1% annually. 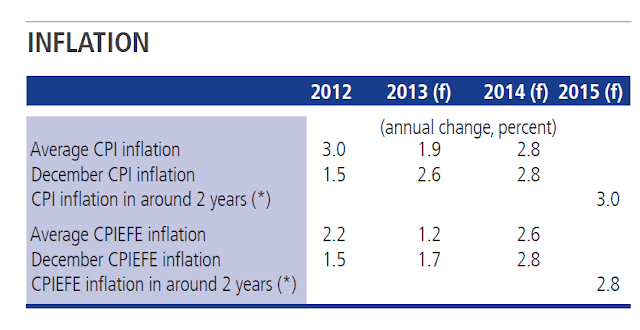 Inflation expectations have remained near the target in the policy horizon. The Chilean ETF has been selling off all year. 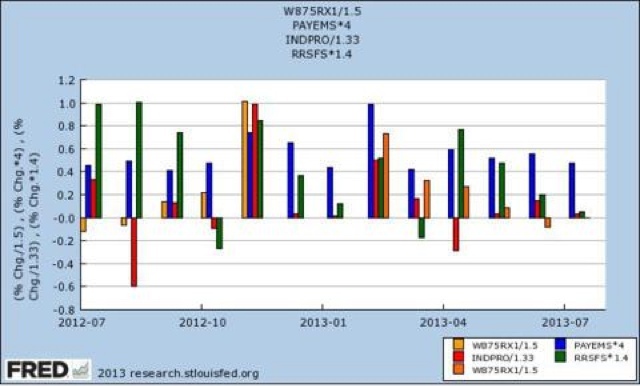 The first move lower occurred between February and early June, with the second far sharper sell-off starting in May. However, over the last few weeks, prices have rebounded and yesterday's action is encouraging. Also note that prices are now above the shorter EMAs with a rising MACD. Over the last few weeks, the Indian market has rallied sharply. However, it appears to be a technical bounce for two reasons. 2.) 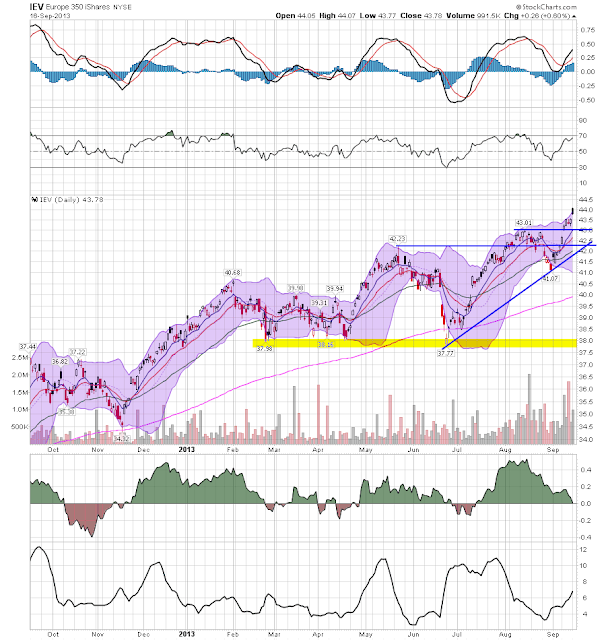 Prices have not broken through upside resistance (at least not yet). Indian inflation unexpectedly accelerated to a six-month high in August as the rupee’s slide stoked import costs, adding pressure on central bank Governor Raghuram Rajan to sustain efforts to support the currency. The wholesale-price index rose 6.1 percent from a year earlier, compared with July’s 5.79 percent climb, the Commerce Ministry said in New Delhi today. The median estimate of 25 analysts in a Bloomberg News survey was for a 5.7 percent gain. 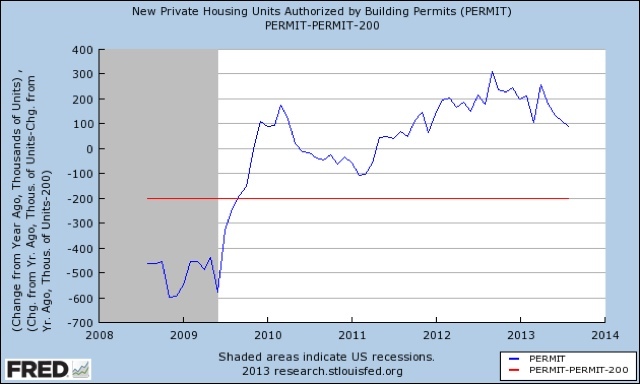 I have said in the past that if there were only one indicator I could have, I would choose housing permits. They are a long leading indicator for the economy that is among the most reliable. With this morning's report on housing permits and starts, we have now gone 4 months without a new high, and we are 87,000 off that high. We are also 3000 less than we were 11 months ago. Similarly, housing starts have now gone 5 months without a new high, and are 114,000 off that high. Starts are still more than 150,000 higher than they were a year ago and 47,000 higher than they were 11 months ago. Note that the only false negative is the shallow 2001 recession, and even then permits were 200,000 under their previous expansion peak. We've been basically stalled for the last 11 months, but we haven't turned negative YoY yet, let alone -200,000 off peak. For me to hoist a red recession flag, I would need to see permits at 800,000 or less. 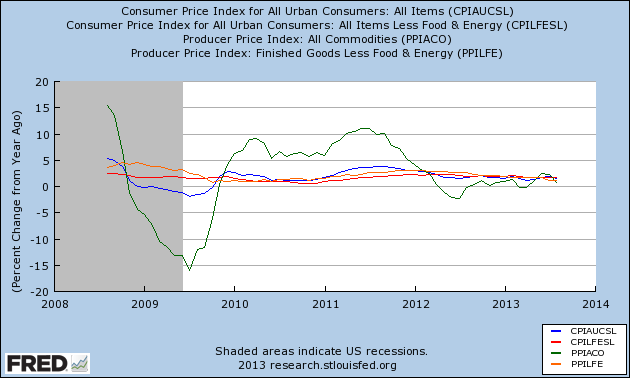 The above chart shows the year over year percentage change in CPI and PPI, both the total number and core. Notice that with the exception of PPI, the numbers have been very contained. The above chart shows the same information except for the last year. Again, inflation is clearly contained. Worries over the end of the Federal Reserve’s bond-buying programme spurred foreign investors to sell US Treasuries at the fastest pace on record in June. Figures released from the Treasury on Thursday showed that outflows of longer-term US securities, which include government debt as well as equities, reached $66.9bn in June. Foreign investors sold $40.8bn worth of Treasury bonds, the highest monthly sell-off on record, according to data from the so-called “TIC report”. Following four consecutive months of improvement, builder confidence in the market for newly built, single-family homes held unchanged in September with a reading of 58 on the National Association of Home Builders/Wells Fargo Housing Market Index (HMI), released today. “Following a solid run up in builder confidence over the past year, we are seeing a pause in the momentum as consumers wait to see where interest rates settle and as the headwinds of tight credit, shrinking supplies of lots for development and increasing labor costs continue,” noted NAHB Chief Economist David Crowe. The Board of the Central Reserve Bank of Peru approved to maintain the monetary policy reference rate at 4.25 percent. This decision is based on that economic growth in the country is close to the economy’s potential level of growth, inflation expectations remain anchored within the target range, the rate of inflation has been affected by temporary factors on the side of supply, and international financial conditions are still uncertain, even though some positive signals have been observed in the developed economies. 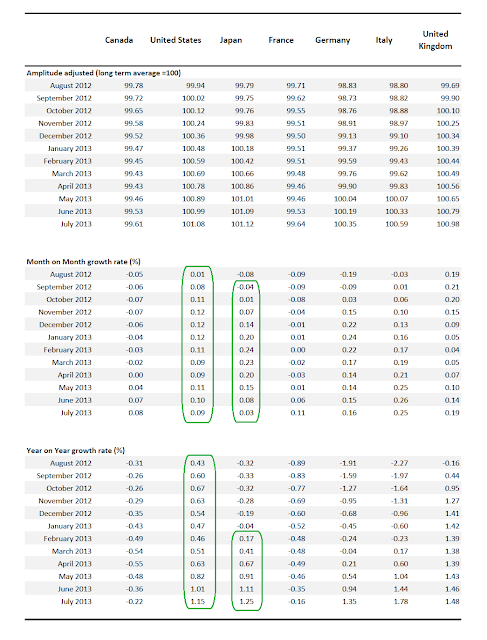 Their overall annual growth rate is printing between 4.6% and 6.9% over the last nine months. We should be so lucky. Unemployment is printing between 5.6% and 6.7% over the last 12 months -- which is below the US level. And inflation is clearly under control. The Peruvian market fell sharply during the late spring and summer, as the market sold-off in reaction to the announcement of the Fed's potential tapering. 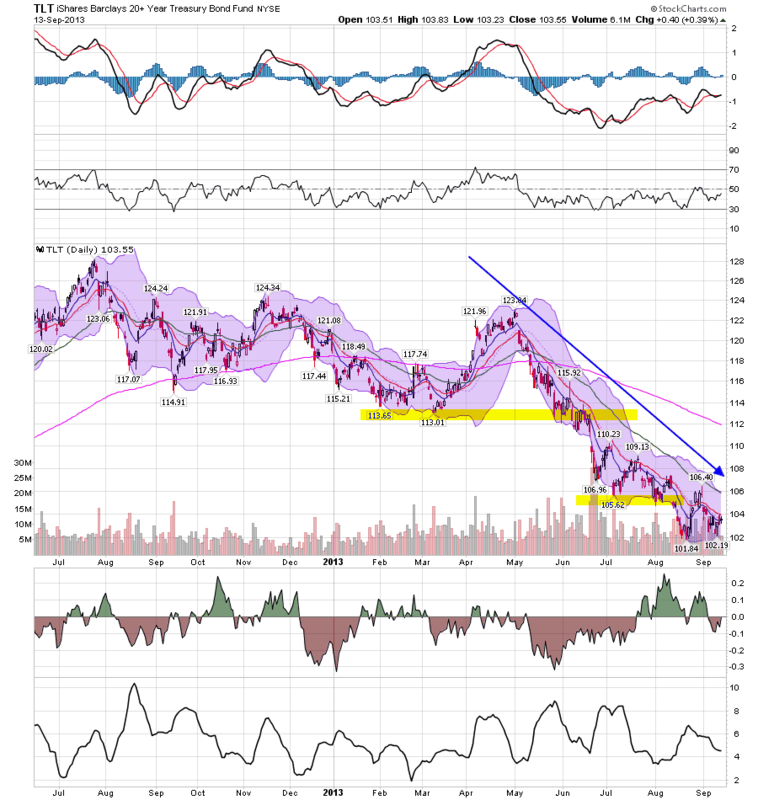 However, prices broke out of their channel in early September, rallying through the shorter EMAs. now prices are weakening a bit, probably to test lows. 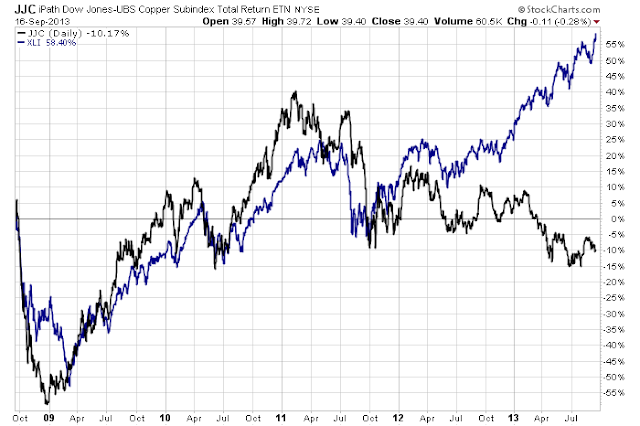 The chart above shows the relationship between copper (JJC) and the industrial sector (XLI). From the beginning of the latest expansion there was a strong relationship between the two. However, starting in the spring of 2012 a disconnect occurred; the two are now remarkably unrelated. I have no idea why this is the case, but I thought it was very interesting. 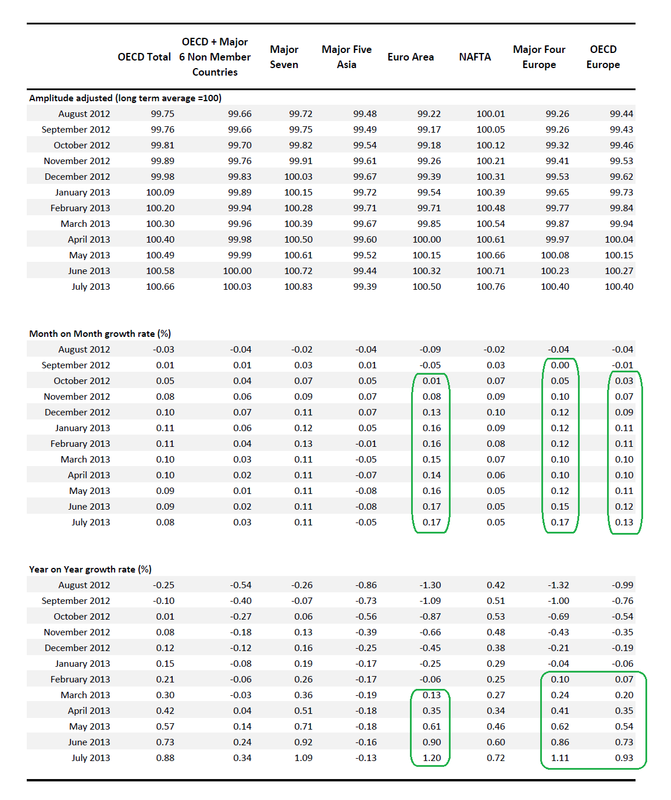 The above table shows the OECD's LEI readings for the euro area. 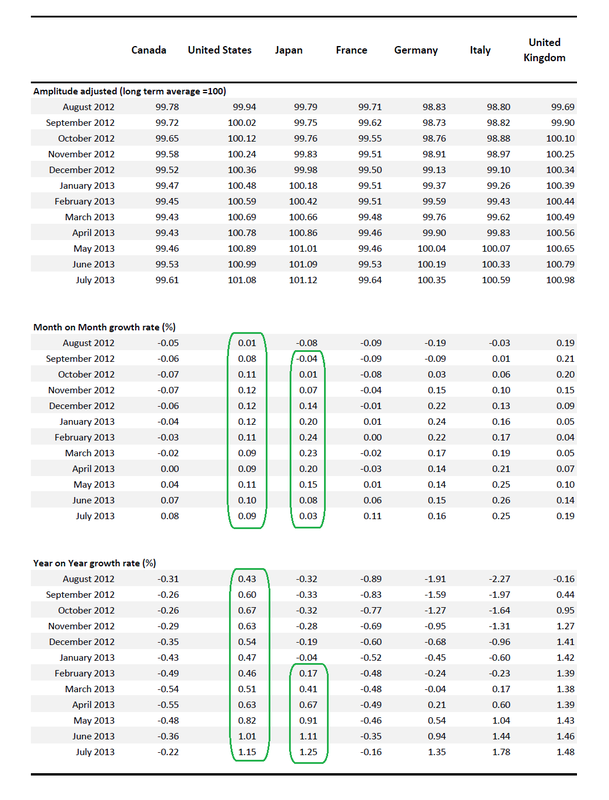 Notice these numbers started printing positive numbers month over month last October; year over year positive results started to print last Spring. The above table shows US and Japan LEIs. The US has been printing positive numbers on a M/M and Y/Y basis for the last year; Japan starting printing M/M numbers a little under a year ago and Y/Y numbers last Spring. Let's turn to the EU and Japan markets (I reviewed the US markets yesterday). The European ETF spend most of 2013 using the 37.8/38 level as technical support while it made moved sideways. 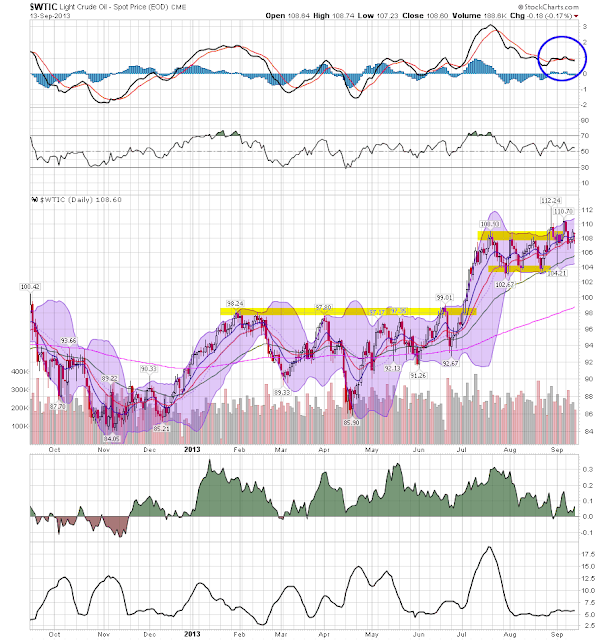 It made one failed rally to the 42 level in late spring, but finally broke through resistance in early August. Since then we've seen a slight sell-off followed by yet another rally higher. After Abe's election, the Japanese market rallied strongly until late May. 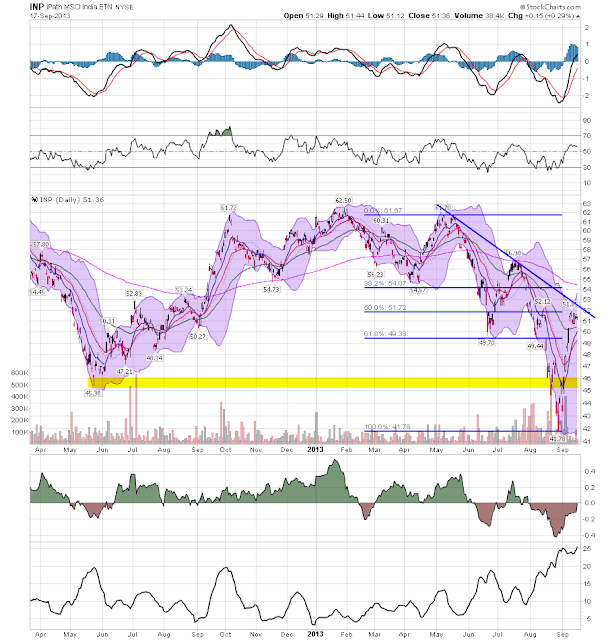 Since then it has been consolidating gains, using the 50% fib level as technical support. With this morning's CPI report (up +0.1% just as I predicted based solely on the price of gasoline), we now have values for 3 of the 4 big coincident indicators of the economy, and there has been an improvement. Note that July is now second from the right. Retail sales were revised substantially positive, and industrial production has had its best reading in 6 months. Payrolls look like they've rebounded, but actually July was revised downward, and August actually held steady from the original July report. Back in January I thought there would be a first half stall and a second half rebound. This is some evidence that is indeed happening. About 2-3 months ago, the Chinese economy hit some rough waters. It started with a public acknowledgment of excess loans with in the banking system and was followed by a spike in short term interest rates. The PBOC didn't do anything to stall the sharp upward spike, a move which analysts interpreted as the bank's message to the banking sector to stop the practice. 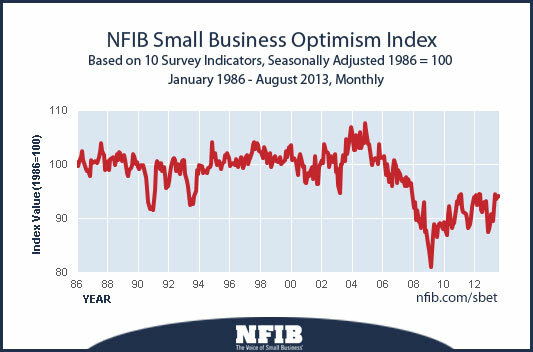 Around the same time, we saw a weakening in some economic numbers. In saying "weakening" it's important to remember that this is a relative term; the Chinese economy was still growing, just at a slower rate. China’s exports increased more than estimated in August and inflation stayed below a government target, helping Premier Li Keqiang sustain a rebound in the world’s second-largest economy from a two-quarter slowdown. Overseas shipments rose 7.2 percent from a year earlier, the General Administration of Customs said in Beijing yesterday. That exceeded the 5.5 percent median estimate of analysts surveyed by Bloomberg News. Consumer prices rose 2.6 percent, the statistics bureau said today, leaving room for extra stimulus if needed. In August 2013, the total value added of the industrial enterprises above designated size was up by 10.4 percent year-on-year (the following growth rates of value added are real growth rates, after deducting price factors), 0.7 percentage point higher than that in last month. 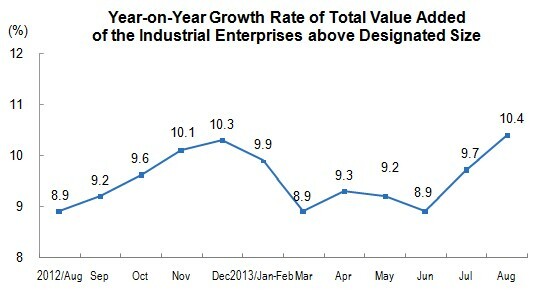 In June, the total value added of the industrial enterprises above designated size went up by 0.93 percent month-on-month. In the first eight months, the total value added of the industrial enterprises above designated size was up by 9.5 percent. From January to August, the private investment in fixed assets reached 16,696.4 billion yuan, a year-on-year increase of 23.3 percent in nominal terms, and the growth rate remained at the same level over the first seven months. 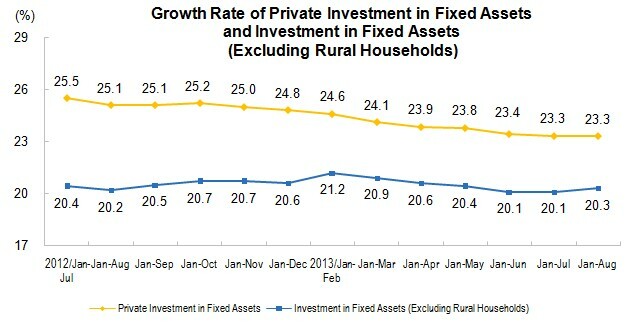 The proportion of private investment in fixed assets to the total investment in fixed assets was 63.6 percent. 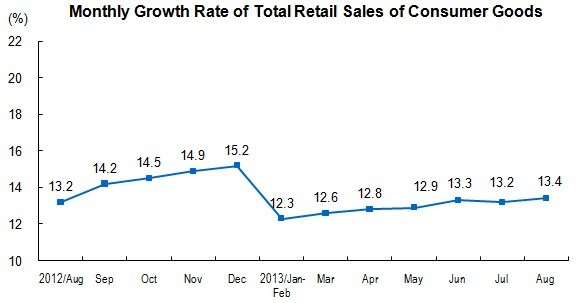 In August 2013, the total retail sales of consumer goods reached 1,888.6 billion yuan, up by 13.4 percent year-on-year (nominal growth rate. The real growth rate was 11.6 percent. The follows are nominal growth rates if there’s no additional explanation). Of the total, the retail sales of consumer goods of industrial enterprises (units) above designated size was 949.0 billion yuan, increased 11.5 percent. From January to August, the total retail sales of consumer goods reached 14,816.4 billion yuan, up by 12.8 percent year-on-year. I looked at the Chinese market last Friday; not much has changed since then. The last five years have not been kind to conservative economic thought. And then there is the uncertainty trope. There was an argument floating around that legislative changes were causing so much uncertainty that businesses were frozen in place. This is a patently ridiculous argument on the surface as the future is always uncertain. Following the logic to its natural conclusion, every two years the US' political climate would essentially prevent businesses from doing anything as a result of the House's election cycle. Someone went to far as to construct an "uncertainty index" to show that this was in fact a real phenomena. Mike Konczal over the the Next New Deal has shown that not only is the uncertainty index bunk, it's also at low levels right now meaning uncertainly isn't holding us back. And finally there's the austerity argument. First, the intellectual backing of this argument -- the Reinhart and Rogoff paper -- was shown to have a spreadsheet coding error that cast doubts over their conclusions. And then the IMF issued a paper showing that austerity was in fact a mis-guided policy. And finally there were the actual results that showed growth did not result from austerity policies; in fact, economies shrank when they were implemented. As professor Krugman has repeatedly pointed out, the real solution to this recession would have been a massive stimulus from the government to stimulate short-term demand. While this would have resulted in increased debt in the short-run, it would also have led to increased growth which would have stabilized and then lowered the debt/GDP ratio over a 5-10 year period. As I've pointed out, the logical step would have been a massive infrastructure build which would have put most of the blue collar unemployed to work and solved the problem of our crumbling infrastructure. This is hardly a revolutionary concept; a simple reading of the Paul Samuelson economics text would have led to the same conclusion. But that involves the government, which is so anathema to some people that they will (and have) cut off their economic nose to spite their face. However, what's really important here is this: conservative economic thought (think University of Chicago and the like) has been dead wrong in their predictions for the last five years. And not just slightly off, but 100% wrong. Think about that track record the next time they start to talk about the future. With the situation in Syria appearing to have a viable diplomatic solution, one of the key ingredients to oil's recent rally is gone. That means we could see a slight sell-off in the oil market. This would be a very welcome development for the US economy as oil prices are currently at a growth-choking level. There are two important short-term price levels on the chart: ~108, where the 10 and 20 day EMA are right now and the 102-104 level. Also remember that oil stockpiles are down which will add some support to the bulls. Consumer credit increased 4.4%: the entire increase is the result of non-revolving credit. While some of this is most likely for items such as cars and houses, also expect yet another increase in student loan debt to be at least partially responsible. See this story from Reuters for the implications. Producer Prices increased .3%. The reports details were very non-inflationary: core rates didn't increase, while the year over year number came in at 1.4%. Import prices were tame as well: Import prices have recorded little change the past 2 months, after decreasing 1.8 percent over the prior 4 months. The recent decline contributed to a 0.4 percent drop in import prices for the year ended in August. 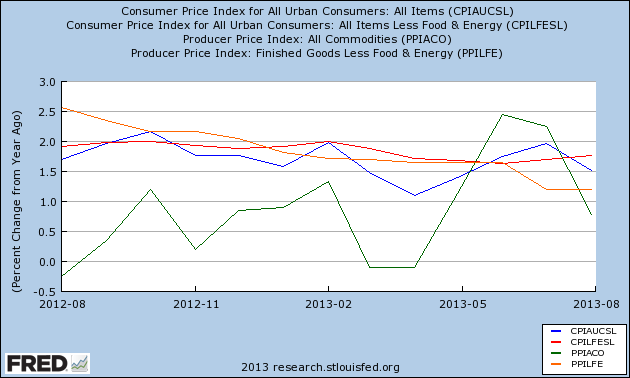 The decrease from August 2012 to August 2013 was led by lower nonfuel prices, which more than offset higher fuel prices. 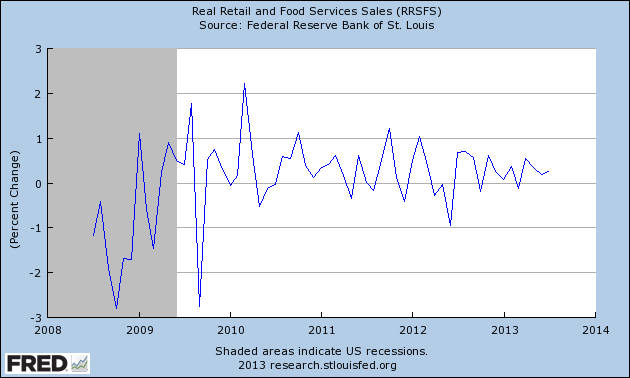 Retail sales increased .2% month over month and 4.7% year over year. Probably the best news in this report was from the auto sales sector, which continue to show consumers buying cars at solid rates. First, the month over month rates of change are not setting any records, but they have been consistently positive, printing between 0% and 1% over the last year-year and a half. 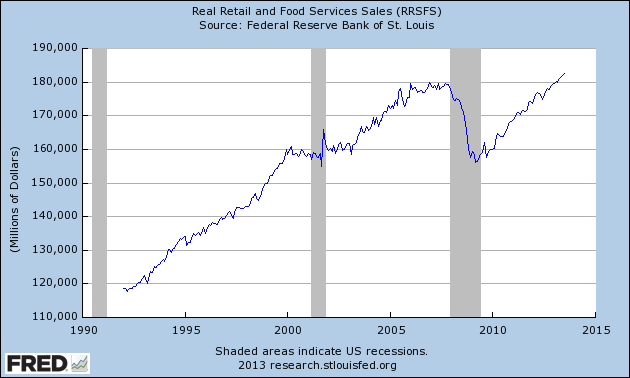 Second, retail sales are now at higher levels than before the expansion. The year over year percentage change in real retail sales has printed between 1.6% and 3.7% over the last 12 months, with most of the readings printing about 2.5%. Conclusion: there wasn't enough data this week to draw a major conclusion on the economy. The good news was prices are clearly contained. This will allow the Fed to taper their asset purchases as needed or viewed appropriate. While the NFIB news was disappointing, this is the same result the survey has printed for this expansion. 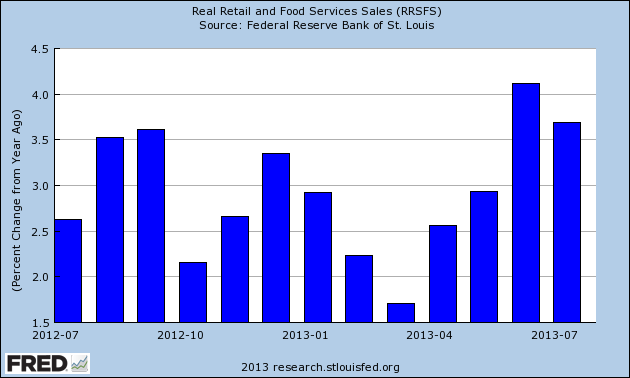 The best news was retail sales, which continue to show purchasing by consumers at a consistent rate. The daily chart still points to an overall consolidation. Price printed at the 170.97 level in early August, which is the year high. Last week, prices gapped higher, but their advance stalled in the 169/169.5 area. 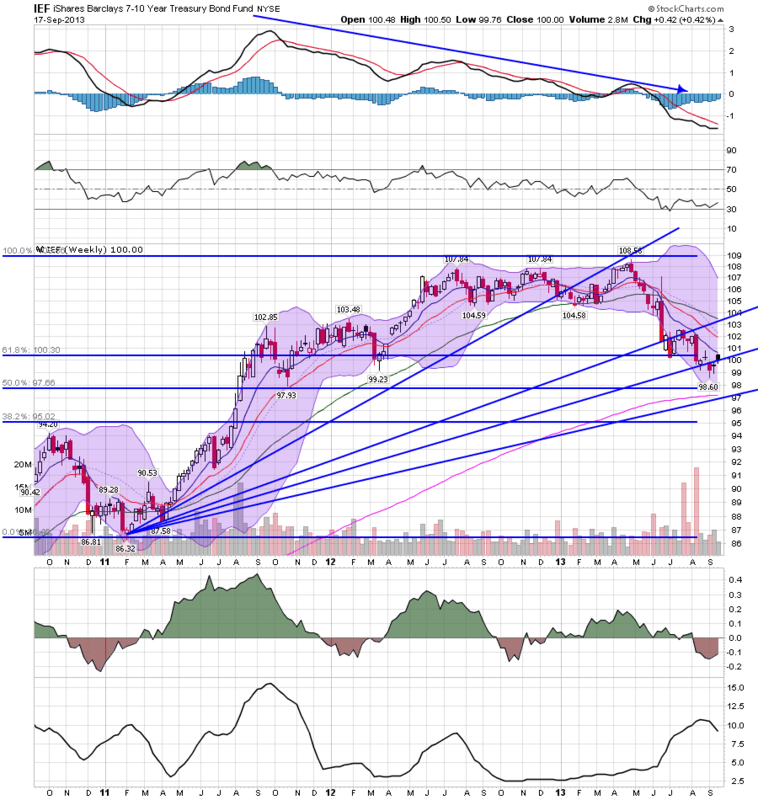 Momentum is weakening and volume in flow is neutral at best. The 30 minute chart puts last week's price action in a bit more detail. Prices rallied on Monday and gapped higher on Tuesday morning. 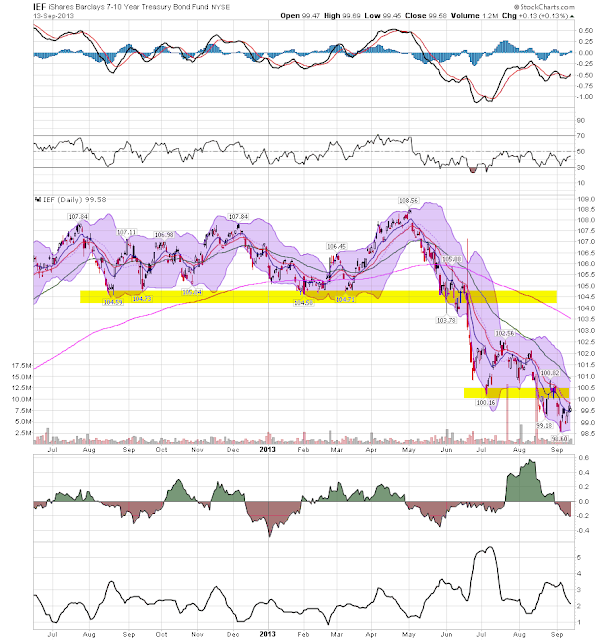 But they remained near unchanged for the remainder of the week, stuck in the 169/169.5 area. The treasury market is still trying to find a low. 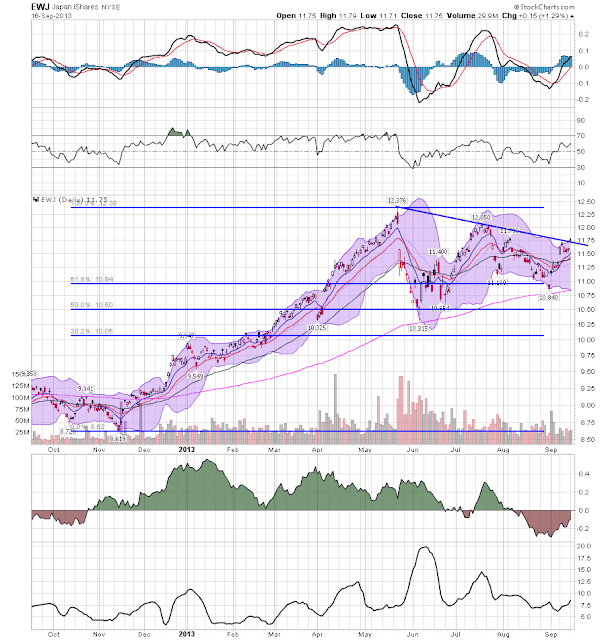 The belly of the curve (the IEFs, top chart) fell through support at the 100 level in mid-August, while the TLTs moved through the 105 level at the same time. Both markets are now trying to consolidate losses. The chart indicators are all very negative; all the shorter EMAs are moving lower and prices are using them as resistance. Both chart have negative momentum and weak volume readings. Fans all know that we are down to the final three episodes of "Breaking Bad." I'm not the biggest fan in the world, but here's my two cents on things to watch for, and one whiny but substantial criticism. 1. Marie is in great danger. I've watched to see if anyone has picked up on this in the past week, but I haen't seen anything. Assuming Hank is killed or gravely wounded in the firefight, one of the natural things for the gang to do is check his cellphone to find out if anybody else knew where he was, and of their involvement in his death. Such a check would show exactly one phone call, made moments before the firefight. That person is the only one who may be able to place Hank, and them, at the scene. That leads directly to Marie. 2. Walt Jr. almost has to die. This show believes in Karma, and there is an innocent dead boy in the desert who must be atoned for. The innocence of Walt Jr. has been scrupulously maintained during the series. Exactly what purpose has that character served in the series if not ultimately to be sacrificed as a holocaust? The innocent dead boy in the desert leads me to my criticism. In real life such a disappearance would be a top priority for law enforcement, and if there was any sense of them slacking off, the parents would be all over the local media to make sure the story stayed in the limelight. That investigation, which would pull out all the stops, would inevitably lead to the realization that crew members on the train that passes by the area might have information. And when contacted, they would almost certainly remember the odd occurrence of the pick-up truck stopped on the railroad tracks in the exact area where the boy went missing. Law enforcement might go very public with trying to locate that driver. If they operated on the idea that the two unusual occurences didn't just happen by chance, they might also check to see if there were any issues with anything shipped on that train. In this drama, aside from Jesse's guilty conscience, there's been barely a peep. Even after Jesse's confession, there's no indication that the boy's grieving parents were contacted. Just once I'd like to see the death of a tangential innocent character develop into a major plot line in a drama. 3. The final episode is supposedly titled "Granite State." Given the established pun of "Face Off," this might be a reference to Walt's ultimate fate: not dead, not just in a prison, but like Hector Salamanca, doomed to spend the rest of his life atoning for his sins in helpless and hopeless immobility, in a "granite state." Going on 10 years ago, Thomas F. Schaller wrote of an emerging Democratic majority in "Whistling Past Dixie." The last two presidential elections have shown the accuracy of that strategy, as Barack Obama put together electoral coalitions that did not require the Confederacy to win, although he got a few of those states anyway. This has literally been the first time since 1928 that the South has been relegated the losing side of national coalition politics. But just as it took several decades for the GOP's "Southern Strategy" to achieve real dominance, so the shift towards the left in US politics is taking a long time to play out. Peter Beinart wrote an excellent piece on that shift, The New New Left," last week. I argued this point with DHinMI back in my Daily Kos days, contending that Howard Dean was the progressive equivalent of Barry Goldwater, the trailblazer who lost badly but showed the way (including the solicitation of a multitude of small individual contributions, a strategy Obama also embraced in 2008 and 2012). I further contended that Barack Obama was a transitional rather than a transformational president, just as Richard Nixon embraced Keynesianism and established OSHA and the EPA even as he also started the rightward shift that came to fruition with Ronald Reagan. Beinart shows how this is happening in the traditional way -- that is, one funeral at a time. Generations are not monolithic, but a 55/45 shift in political thinking in an age group can have a profound effect over time. The Silent Generation has traditionally skewed conservative, early Boomers liberal, and late Boomers and Gen X conservative. Now the Millenials are skewing liberal, and it is likely to have a profound effect on the center of gravity in US politics. [Political] generations [are] born from historical disruption.... [P]eople are disproportionately influenced by events that occur between their late teens and mid-twenties.... After that, lifestyles and attitudes calcify. For Mannheim, what defined a generation was the particular slice of history people experienced during those plastic years. Indeed, this fossil has passed on the hopefully sage wisdom to many young people that "probably 90% of the most important decisions you will ever make will be made between ages 18 and 25. You just won't know it until much later." Obama, in describing his own political evolution, does that again and again: “as disturbed as I might have been by Ronald Reagan’s election … I understood his appeal” (page 31). “Reagan’s central insight … contained a good deal of truth” (page 157). “In arguments with some of my friends on the left, I would find myself in the curious position of defending aspects of Reagan’s worldview” (page 289). [I]n addition to coming of age in a terrible economy, Millennials have come of age at a time when the government safety net is far more threadbare for the young than for the middle-aged and old. Millenials have experienced the full fruition of the old-fashioned trickle-down conservative economic philosophy. The majority of them have decided that it has been a disaster for them, and are beyond convincing otherwise. An additional number of open-minded older voters have arrived at the same conclusion (and I have had detailed discussions with both types). As the nomination of Cory Booker, a thorough Wall Street corporatist whose liberalism is that it is OK with him if your son is gay or your daughter has an abortion, shows, the progressive argument has a long, long way to go. But Beinart has made a potent argument that it is happening -- as I said above, one funeral at a time.